Isaiah Crowell played one year at Georgia in 2011, racking up 850 yards on 185 carries and 5 TDs as a Freshman, but an off-season run in with the law caused him to be dismissed from the team. A month later he enrolled at Alabama St. and was the team’s leading rusher with 843 yards and 15 TDs. The following year he had career highs in virtually all categories with 170 carries for 1,121 yards and 15 TDs. Crowell graded well enough to merit as high as a 4th round pick in the 2014 draft, but perhaps due to his earlier run in with the law back in 2011, he was not selected. Instead he became a highly sought after free agent. 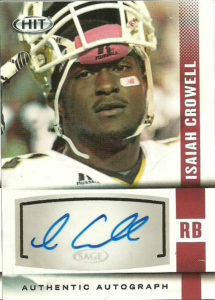 Eventually Isaiah signed with the Cleveland Browns. Clawing his way up the depth chart eventually supplanting Ben Tate and sharing duties with Terrance West, Crowell rushed for 607 yards and 8 TDs on 148 carries in his rookie debut. His 2015 saw small upticks across the board with 185 carries for 706 yards and 4 TDs to go along with 19 receptions. Isaiah started a full 16 game slate in 2016 and rushed for 952 yards on 198 carries, scoring 7 TDs including a league long 85 yard gallop. He also displayed a touch of the hands corralling 40 receptions for 319 yards. As you look at Isaiah’s statistics, he continues to show pleasant upside in his young and promising career. Like a nice house in a bad neighborhood, Crowell could be a solid find (on a poor Cleveland offense) in any upcoming fantasy league going into 2017.